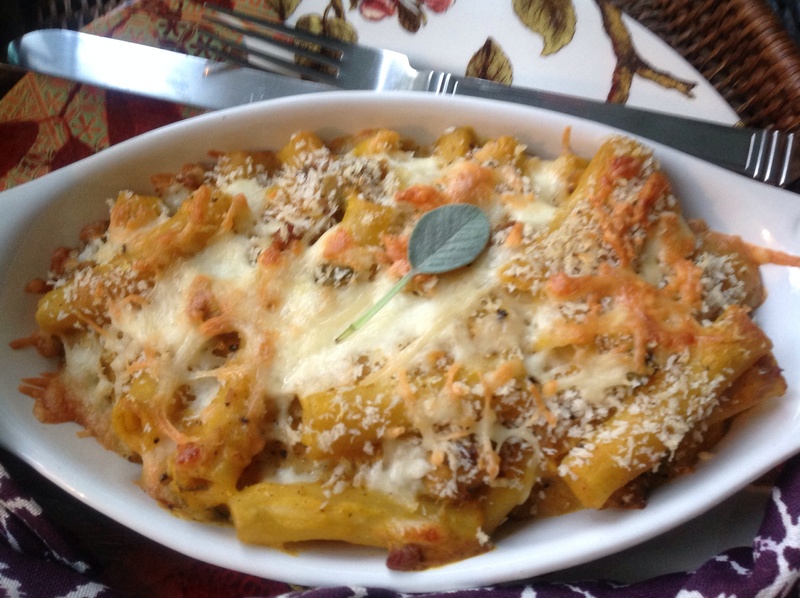 Enticingly aromatic when served straight from the oven, with a golden au-gratin top, this pumpkin, sage and sausage rigatoni is a wonderful rustic fall dinner dish. Pumpkin is one of those super foods boosting our immunity and this casserole serves up a big dose. 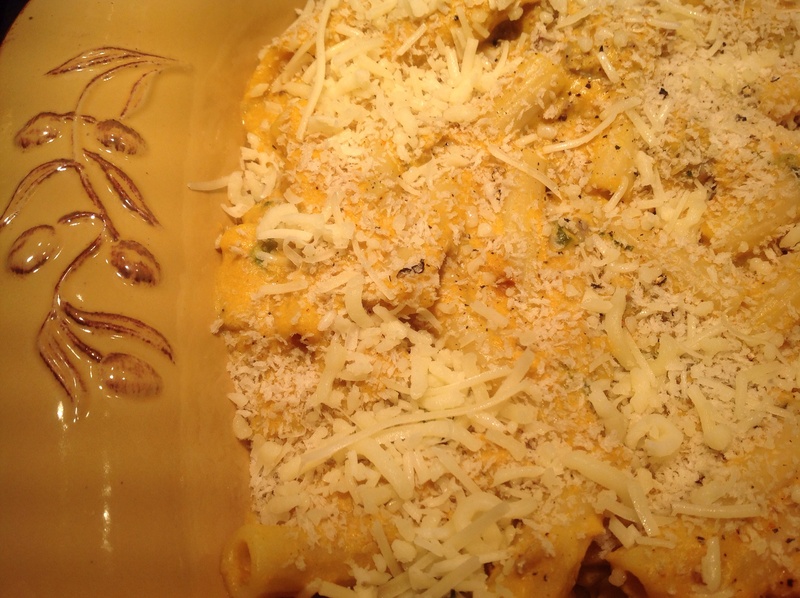 The rigatoni is enveloped in a creamy, velvety custard made from the pumpkin purée, milk, mascarpone, egg yolk and grated cheeses seasoned with fall spices. Simple, make-ahead but oh so good! 1- Preheat oven to 350 F. Bring a pot of water to a boil to cook the pasta adding the salt. 2- Remove sausage from casing and brown in a large pot, over medium heat, until cooked, breaking up any clumps. Drain off fat. Add chopped sage and reserve. 3- Cook rigatoni as per package directions, minus one minute. 4- While pasta is cooking, make custard. 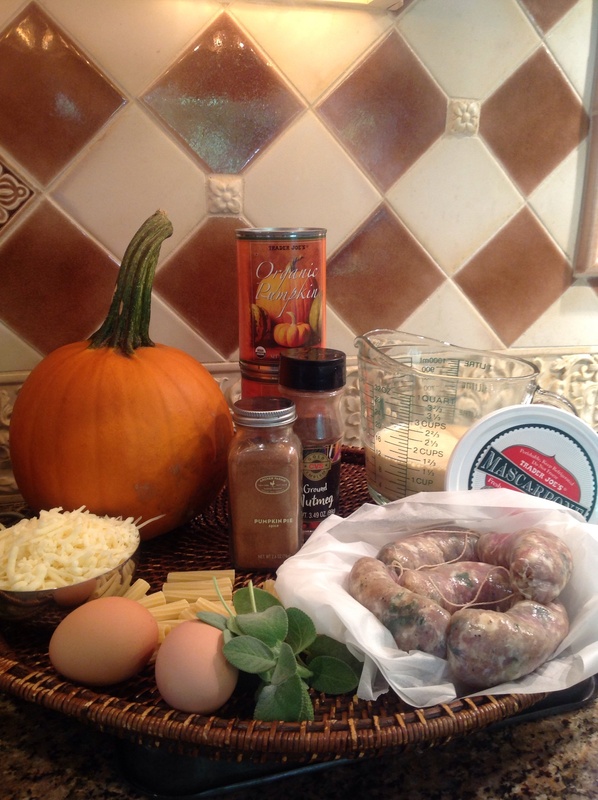 Using the same pot as the sausage was cooked in, whisk together the pumpkin, spices, milk, egg yolks, mascarpone and 1 cup of the grated cheese. Cook over medium heat, stirring while cooking, until cheeses are melted and custard is bubbling. 5- Drain pasta and reserve 1 cup of the cooking water. Return to pot, add sausage and the pumpkin custard and gently mix to combine. 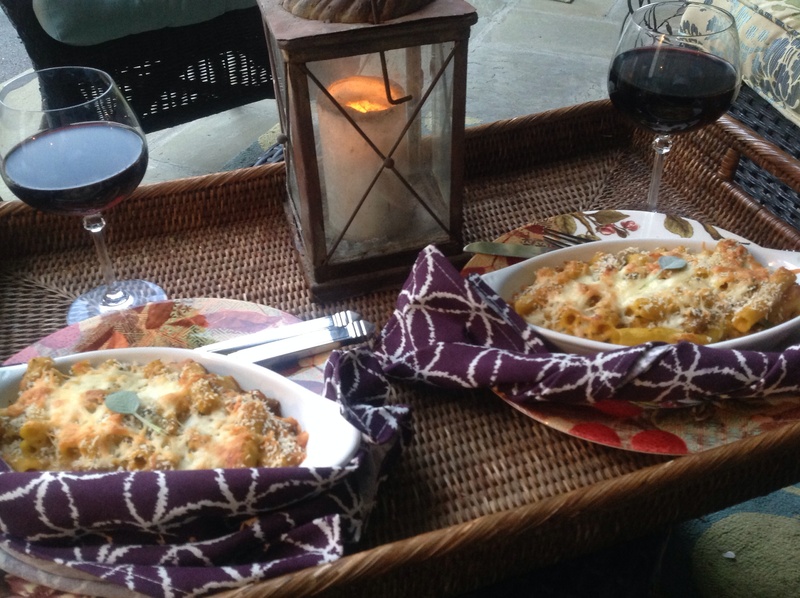 6- Pour into a 13 X 9 X 2 dish or in 8 individual oven-safe gratin dishes. Sprinkle with the panko bread crumbs, some fresh ground pepper and finish with the reserved 3 T of grated cheese. 7- Bake at 325 F for 20 minutes, uncovered, on the middle rack, until golden brown. Increase heat to broil and place under broiler for 1 minute. This is the first of many pumpkin inspired dishes I will be featuring throughout fall. I looove pumpkin and it is so good for us! I hope you do too! 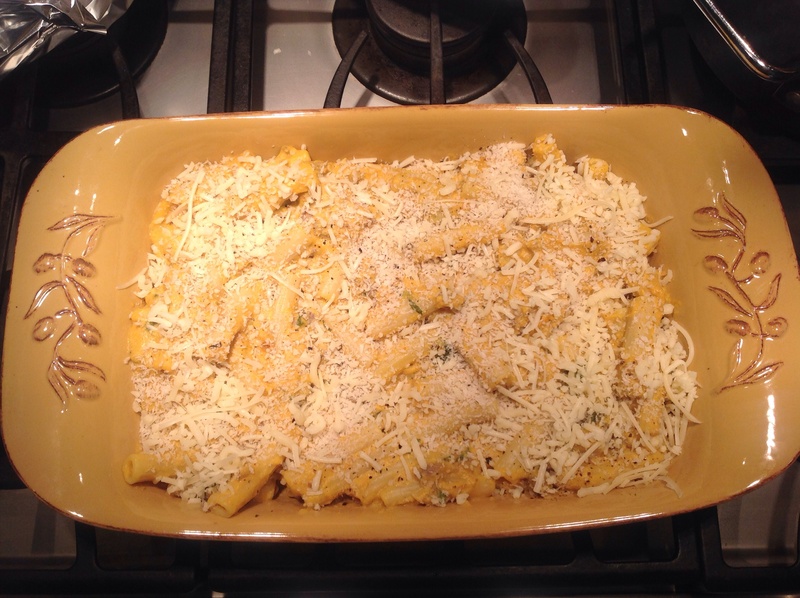 This entry was posted in Recipes and tagged Baked pumpkin sausage rigatoni with fresh sage, Cheesy pumpkin sausage rigatoni, Creamy pumpkin rigatoni, Pumkin rigatoni, pumpkin sausage casserole by Johanne Lamarche. Bookmark the permalink. What a fabulous recipe Johanne!! I love the sound of this with the Italian sausage and the pumpkin! Look forward to seeing your other pumpkin recipes now. Thank you Selma! Is cooking with pumpkin as popular in the UK as it is in North America? Not in the same way. 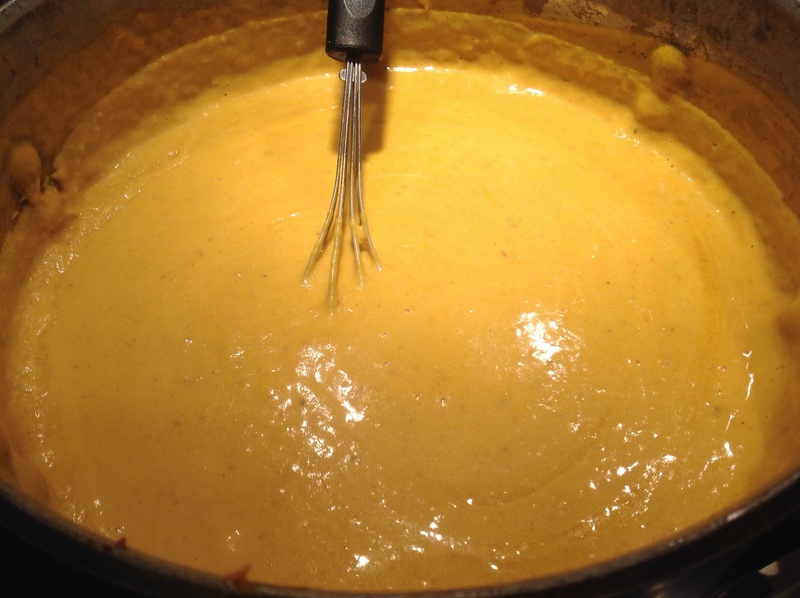 We tend to cook with fresh pumpkin – canned pumpkin is not easily found here! definitely gonna try this recipe with my fresh chorizo…. See Dedy, YOU make the sausage where as I get mine at the butcher’s! Let me know how it turns out. I think the heat from chorizo is going to be really delicous in this recipe! Enjoy.